What's Next? - The Unemployed Geek: About damn time. Doc talks at "40 going on 14"
I'm 38 years old, was until recently unemployed (again) and a huge geek. These articles will cover games, comics, sci-fi and fantasy books and movies, as well as what I'm doing without a regular job as I figure it all out. This blog is about geeky stuff, being out of work, and where those things intersect. For 20 years, I've known Joel, Mike and Pat. We've been through a lot, even if we haven't all kept in touch as often as we'd like. We met through performing on stage and playing D&D and Shadowrun in college, and lived in the same dorms and later apartments for years before marriage, moving away and the rest of it meant our respective paths diverged for a bit. In those years, at one time or another, we've all worked as comedians – stand-up, improv, internet radio, etc. We just never collaborated the way our friends and spouses always hoped we would. Until now. From "A Midsummer Night's Dream," I'm far left holding a brick, Pat is dressed as a Lion next to me, and Joel is the blonde with the goatee on the far right. I have strange friends. It is no secret here that when I am gainfully employed, I don't post nearly as often as I'd like to on this blog, or even to my Twitch/YouTube channels. I'm still out there experiencing geek culture, and still feeling the effects of my months being unemployed, but I post when I want to, not because I need to anymore. I've come to terms with that. I like these outlets to be a labor of love, not one purely of obligation, because the content is always better when I'm inspired, rather than required to create it. The collaboration I've found in this podcast, called 40 going on14... well, it is inspiring. A few words to talk about the other folks on the podcast - Longtime readers already know Joel from his guest blogging here, but unless you already follow his own blog, where I have had the privilege of writing for myself, you might not know about his podcasting history. He was a part of The Awful Show, and is now one of the Undercover Unitards, bringing comedy and music to the internet weekly. He also does a more personal show, The Sunshine Happy kPants Hour (the "k" in kPants is silent.) Mike and Pat have influenced a lot of the events that inspired me to write here about movies, games and comics. Since college, we've shared trips to Gen Con, various roleplaying campaigns, and done comedy together whether on-stage or off. 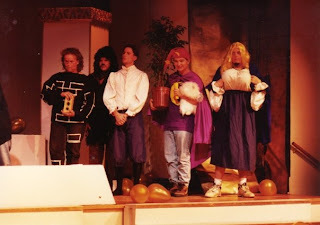 Pat has recently been doing stand-up back in his home state of Texas, and Mike was at the helm of another show not so very long ago called "TikiGeeks." 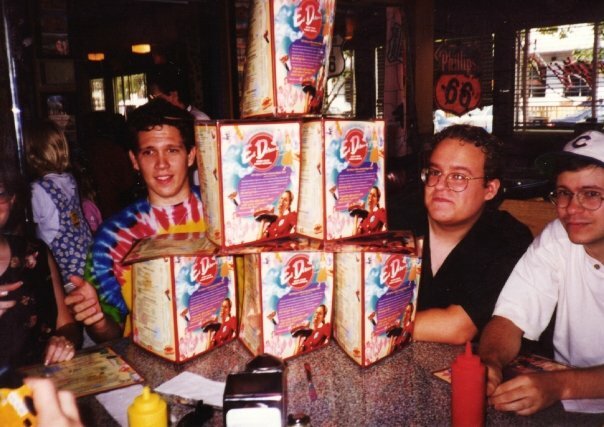 Mike and I at Ed Debevic's, back in our college days. The podcast takes on elements of pop culture that we remember from when we were growing up, and seeing those things repeating themselves now that we are approaching middle age. For our first show, we all watched both Conan The Barbarian films (1982 and 2011) and ran them through the paces of what we all thought about them. It was a hell of a lot of fun to create, and I'm pretty proud of the finished product, especially for a first try. If you haven't tried podcasts before, but have a 30-minute or more commute when you might listen to talk radio... give us a shot one day out of your week. I think you'll be glad you did. I know I'm happy helping make it. a momentary lapse, with joel. Ocean Marketing/Paul Christoforo and Penny Arcade: Why Customer Service Matters on the "real internet." There vill be.... SANDVICH! - Team Fortress 2 Free to Play, one week later. My Little Pony... Really? Bronies, Kids' TV and Fandom. Star Trek and the Holodeck: The Ultimate Virtual Reality. Minecraft: HCFactions and Mine-Z, plus - Interview with Lead Admin HighlifeTTU! As stated below in Attribution, any images used on this site have, where possible, been displayed in compliance with US Copyright Law. Many are public domain or have been posted with no restrictions on reproduction. Where this is not the case, images have been chosen for their suitability for qualification for Fair Use Doctrine. If you believe that an image displayed here belongs to you and does not fall under Fair Use Doctrine as specified in Section 107 of United States Copyright Law, send an e-mail to docstout076@gmail.com with a request to remove the offending image(s). ©2011, Joshua Brown. All images property of original owners, displayed under Fair Use. Theme images by fpm. Powered by Blogger.